Do you ever come off the court thinking that you’ve lost a game you should have won – just because you were lacking organisation? In Futsal, organisation is everything and too often teams end up losing because they’re badly lacking a strategy. The truth is that whilst a lot of your success in Futsal is reliant on the skill of your players, the keys to winning games comes from experience, good organisation, and playing smart. That’s where it is absolutely vital to think about the Futsal tactics and formation that you and your team are going to use. Good tactics can transform any ramshackle band of misfits into a competitive team that other sides will fear. Below you’ll find a range of formations that your team can try out, to bring that much-needed organisation and winning-structure to your games. Quite simply, spending some time thinking about this could be the single most useful thing you can do to improve your team’s chances. At least one person needs to be attacking – a good offensive player will release the pressure from the defense. Remember, playing with depth is as important as playing with width (you can find loads more detail about this important point in our article on having a dedicated attacker, the “pivot”). Somebody has to be committed to defending – often you see teams falling apart because there isn’t a dedicated player who stays back, keeping things tight in defense. Good teams know that you need to play with somebody in this role – that’s why a lot of them will deploy a “fixo”, or last man“last man”. You might think that’s stating the obvious, but it’s common to see teams playing with either nobody attacking, or more often nobody defending. If you play against a good team and neglect either of these principles, you’re going to struggle! There are only four outfield players on the court, which means there are only a limited number of ways to arrange your team. Tactics can often be over complicated, with people coming up with all sorts of advanced playing systems. Don’t fall into the trap of running before you can walk. Pick the formation that appears to suit your squad the best and start applying it. 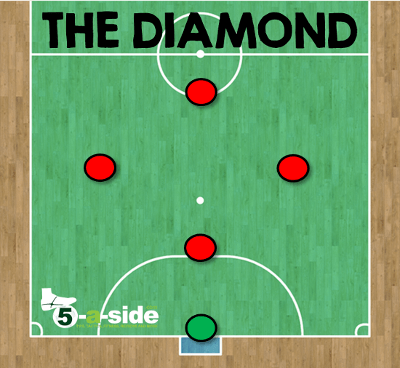 The best way to apply any of these formations is to have it in mind as your basic defending shape. This is the pattern that your players should drop back into when you don’t have the ball. When you’re on the attack, it also gives a framework for shaping the play but as players will end up rotating and moving into space to create passing options, things are more fluid and so you shouldn’t obsess about sticking rigidly to the exact formation shape or it will stifle your creativity. So let’s start by considering the following formations. 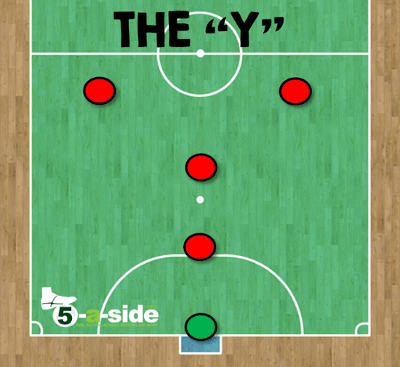 This is one of the most popular formations, and provides balance between defense and attack. Leading the forward charge is a dedicated attacker (the pivot), whilst there’s also a dedicated player to marshall things from the back (a fixo or last man). The two midfield players (“wingers”) are expected to support both the defense and the attack, which can help the team adapt the formation to what is needed most at any moment in time. + Should give you width where you need it most, in the middle of the pitch. – Players naturally seem to prefer attacking to defending – if both wingers focus too much on attack this will leave the defense badly exposed. It requires these players to be disciplined and ideally should be back behind the ball when a team is defending. – The two midfield players need to be fit, mobile, and especially able to develop a good partnership (e.g. to know when to sit-back and cover if everyone else has gone forward). 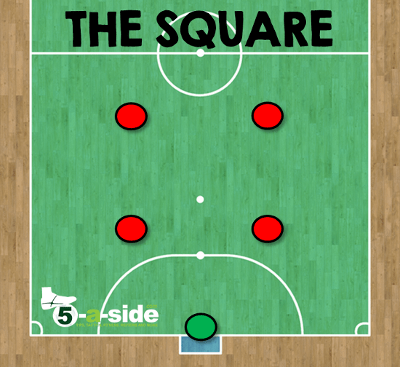 The 2-0-2 formation, sometimes known as ‘the square’, essentially splits all four players in your team into the two main areas of responsibility: defense and attack. It is simple, clear and can help develop good defensive and attacking pairings. Although two players are encouraged to push forward and two to stay back, these roles are going to need to be fairly flexible as the attackers will need to help the defense and vice-versa (and at points in the game it’s likely that roles will briefly rotate). Most teams attack and defend in numbers of at least three. + Excellent if you’re playing a stronger team and thinking of playing a half-court press (i.e. you sit back and press them only in your own half) before hitting the opposition on the quick counter-attack. + Has an outright striker who can concentrate on attacking – often referred to as the ‘pivot’ (see our essential guide to the pivot here) + The midfielder is likely to give the defense more support than in the 2-0-2. + If the defenders are willing runners and have good movement then their runs from deep are going to be hard for the opposition to pick up. 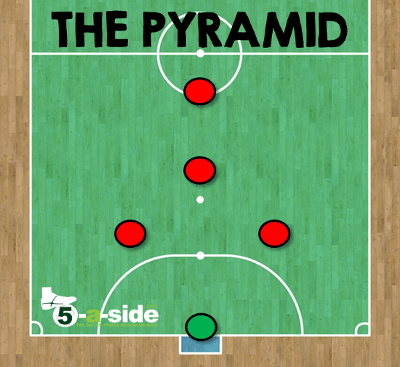 Selecting one of the tactics above (or developing your own) is a great start to getting your team more organised, and without it you’re unlikely to do much in the way of winning at all. But a playing formation is only going to take you so far. You can’t just put 5 players on the court in a pretty shape and expect to be winning every game. What determines your chances of success and failure with any tactical system is how your squad understand the basic principles of attacking and defending; how well you move as a team to create space; and how you all defend behind the ball as a cohesive unit when you’re not in possession. 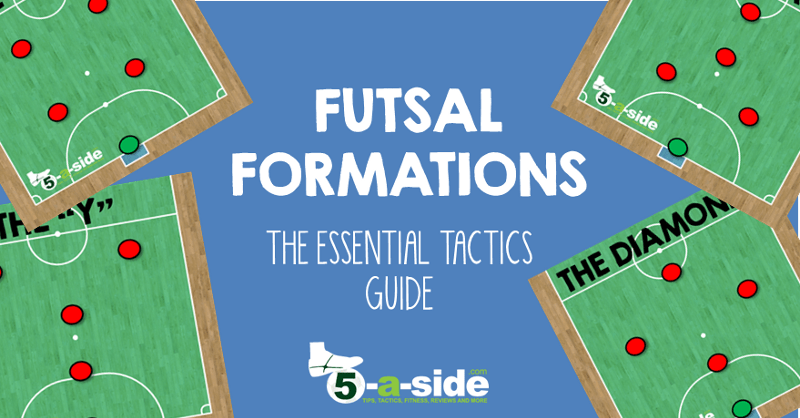 So, once you’ve given the above formations some thought, it’s mandatory reading to move on to the 25 Essential Futsal strategies you must know. And if you’re just starting out, it’s also worth checking out the top 10 futsal tips for beginners. How does the ‘gatekeeper’ work? Hello! Really liked formations you provided! Glad you enjoyed it haytham, let me know if you want us to cover any other topics that will help. Of the options you pointed out, I’ve had the most success with the diamond. You do need to have a fairly decent Pivot to play it, but I think it’s the most simple and most effective for the teams I’ve played in. Hi Adam, I’m also a fan if the diamond. It’s actually the one that the team I’m playing in are using at the moment and it’s working well for us. We don’t really have a specialist Pivot, so often it becomes more of a 1-3 but doesn’t seem to hold us back too much.